There are different things to know about teaching in each state. 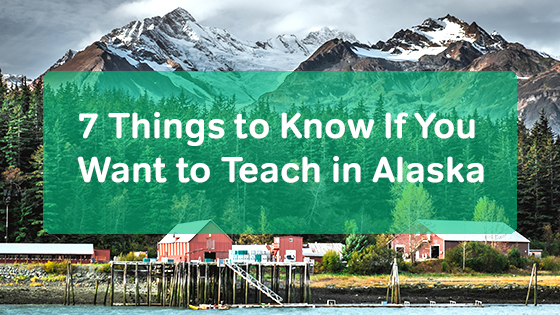 If you want to teach in Alaska, here are some things that you should know. Alaska tends to have much smaller cities than the rest of the country. In fact, Anchorage, which is the largest city only has a population of about 300,000 people. Some of the other cities, such as Fairbanks and Juneau, have much smaller populations. These cities have no more than 30,000 people in them. On top of having smaller cities, many of the cities can only be reached by plane or boat. This lends to feelings of isolation and seclusion. Alaska has long, dark winter days. One city, Barrow, experiences 67 days of darkness in the winter. Other parts of Alaska average 3-6 hours of sunshine each day. And during the summer, there are weeks where the sun never sets in certain parts of the state. To deal with this, most people purchase window coverings that allow them to shut out the sun at night. There are several different cultures that one should know about in Alaska. Some of the native cultures include Eskimos, Aleuts, and Athabascans. Depending on which cultures reside in the area where you live and teach, it’s important to get to know your students' culture. Meet the community leaders from these cultures. And participate in their cultural celebrations and activities. The state has a shortage of math, science, social studies, and special education teachers. So if you teach these subjects, there are many opportunities available in Alaska. Take a look at the annual teaching salary per state in the U.S. Then look at Alaska. The average annual teaching salary for someone teaching in the state of Alaska is $71,460. So yes, the salary tends to be much higher than the national average for teachers! However, Alaska also has a higher cost of living than other states. One reason for this is that many groceries and supplies need to be flown in by plane or brought by boat. To become certified in Alaska, you need to apply for your teaching certificate. If you’re licensed in another state already, you can apply for an out-of-state teacher certificate. Otherwise, you should apply for an initial teacher certificate while completing your degree at an Alaskan teacher education program. If you need help getting certified, check out the Alaska Transition to Teaching (AKT2) program that was created through the US Department of Education. When teaching in Alaska, there are several teaching associations you can join. One of which is NEA-Alaska. As an affiliate of the National Education Association, this organization was founded in 1922. It works to support teachers and promote education throughout the state. Check out this organization and others to find out how they can support your career. Before taking a position anywhere, it’s important to research the area. Know what you can expect if you decide to teach in Alaska. Learn about the advantages and disadvantages to determine what would be best for you.